A full garage environment model designed for mobile game projects. A Modern US Marine character for use in your game development projects. A full set of (8) mobile-optimized buildings for your city environments. A mobile-optimized car pack designed for your mobile racing games. A US football player for use in your game development projects. A low-poly light aircraft for your mobile or web projects. A low poly optimized light aircraft for your mobile or web projects. 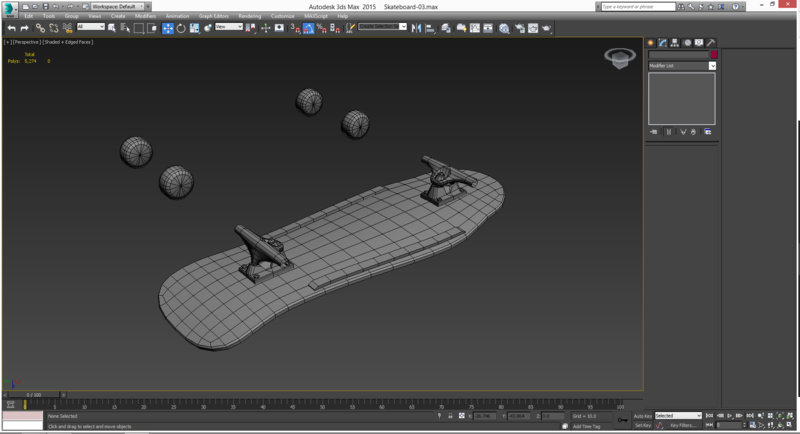 Civilian characters with (23) animations comprised of various idle, walking animations, running, and strafing. A vehicle physics setup that uses built-in Unity components and custom C# to allow control of different vehicle types. What started out as a minor skirmish soon explodes into the deadliest battle ever to take place on United States soil. This is an art asset for the game. It's an older early 1980's television set seen as a prop in the main character's bedroom. 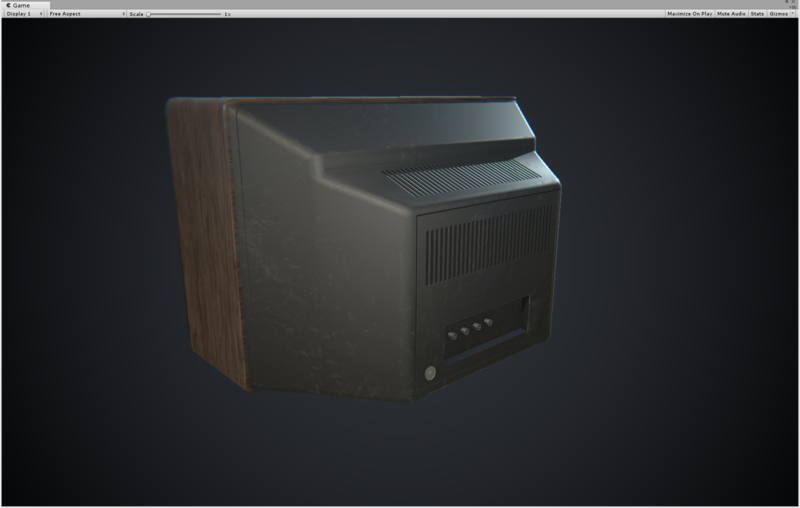 The asset was modeled in 3ds Max, textured in Substance Painter and rendered in real-time in Unity 2018.1. That was a pretty cool experience. I have only one recommendation. Would be very nice to have that rear camera pulled back just a bit to see the full Enterprise and maybe to have a small amount of damping on the camera when I yaw or roll. The other camera angles were great, I could almost recreate the flyby in the show's intro. In this video I go through some of the latest changes to the source Unity project. These include polishing a rock solid physics-based controller, implementing a rudimentary audio system for the player, creating a pseudo "surface" detection system and the very beginnings of an animation control system. 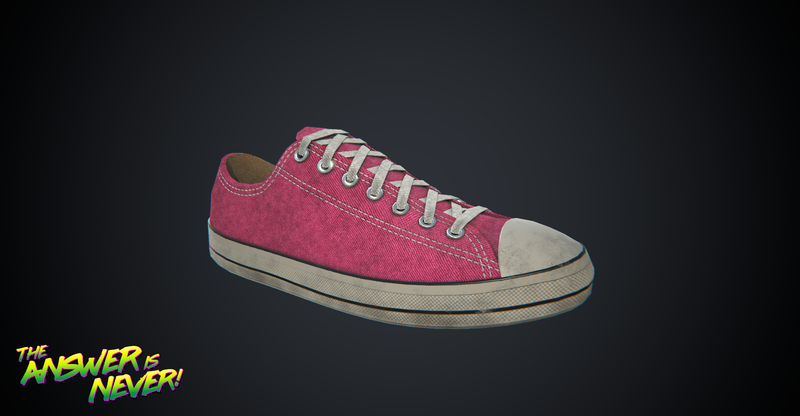 This is the "final" version of a shoe that is wearable for the main playable character in The Answer Is Never! The art asset is rendered in Unity 5.64 using a Standard Specular Material, the Post Processing Stack and a custom HDRI image. If you are interested in the creation of this game and it's artwork/codebase please consider following this project on Twitter. I would be forever appreciative. itch.io Community » Game Development » Devlogs · Created a new topic Creating Art Assets for The Answer Is Never! 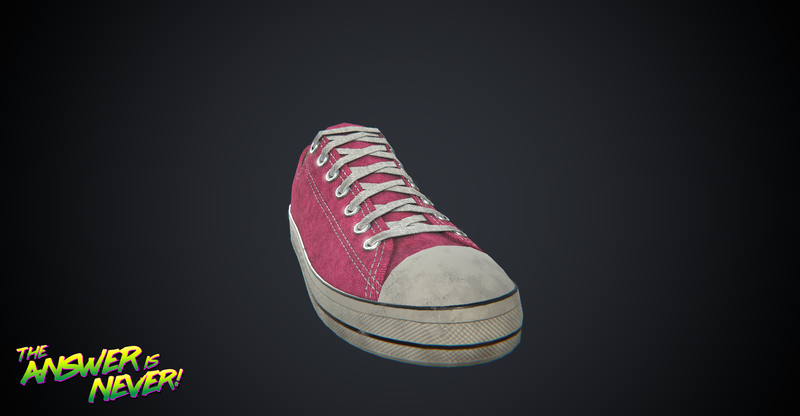 I spent my "off day" today modeling the hero character's shoe. 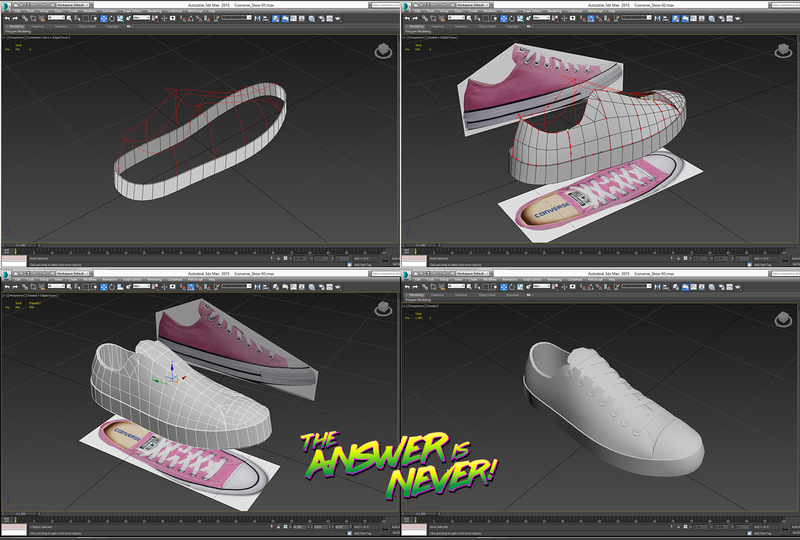 It's based off of an old school Converse All Star shoe. As you can see in the progression of the images I start out by drawing splines for the more complex curvature and then create polygons between them using a lofting technique. Eventually it builds up a nice model. 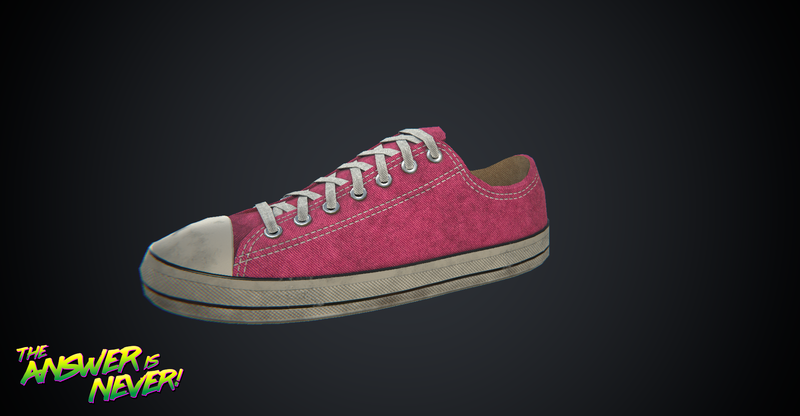 Tomorrow I might find time to do the texturing portion and make this look like a real shoe! 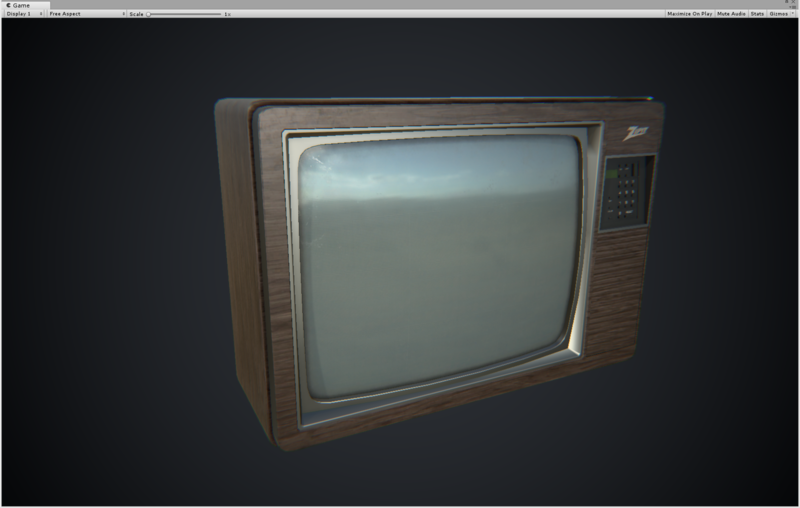 The texturing is coming along nicely. I should have this wrapped up over the next few days. I only have very small bits of time to work on it in the evenings. Luckily Substance Painter makes things move along very quickly in short bursts. I work during the day for Roblox. Go to school from 6 pm - 8 pm and then get home around 8:30 or so, and do a small amount of modeling for 2-3 hours. I wrapped the base mesh for this asset up over the course of the last two nights. Looking forward to bringing this into Substance Painter. I've started modeling the first asset for The Answer Is Never! 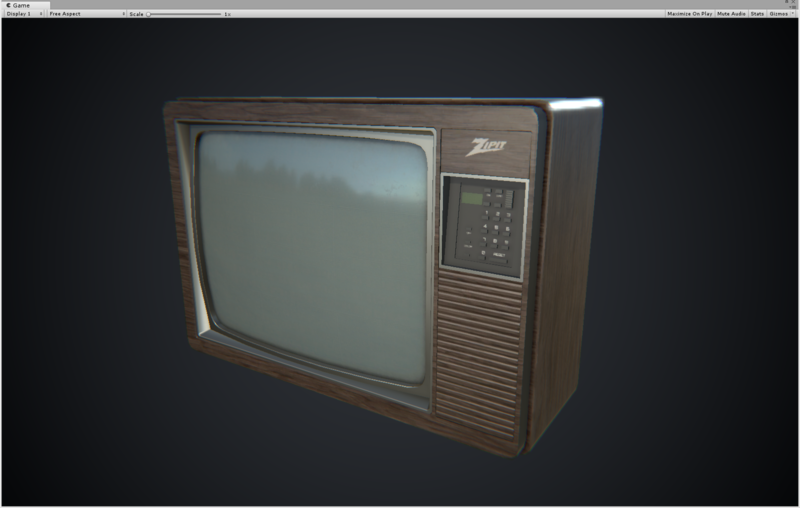 It's not much yet, but it will start looking pretty once it gets into Substance Painter. Stay tuned to see the 1988-era skateboard goodness. This is a thread for posting up the work-in-progress art assets for the game. 3d models, 2d textures, illustrations and logos. I've purchased the domain name, set up proper web hosting for the site and populated the content I have right now. Pretty exciting to see it fleshed out in this initial form. Hoping with work, school and side development I will have a lot of pretty stuff to fill out this web site! Yeah I am definitely not happy I don't have any to post up yet. I haven't started on any artwork other than the title logo. I do however have footage on YouTube videos for the dev log. Maybe I can embed a Youtube video or a few on there for the time being? I'm new to this platform so I don't know it's full power. itch.io Community » General » General Discussion · Posted in Why won't anyone download? You are the person who's site I found doing research the other night. Your chiptune soundtracks will fit very nicely with the 80's theme of one of my main projects. Thank you for putting all of that work into your web site. I did experience what I thought was a small bug. I went under deck and the audio changed to an "under deck" ambient audio sound. (sounds of water lapping the hull). I returned to the top deck and the "under deck" audio was still playing up top. Sounded a bit strange. Well done. Even though it looks good in 2D there is some serious potential to maybe sell a 3D version of this on the Asset Store. This is a wonderful demo. Hope you guys get this fleshed out into a full game. One of my favorite parts of Resident Evil 7 were the mannequins upstairs. This definitely has my interest. Hi everyone. I've started about a month ago on a project I really wanted to do. It's called The Answer is Never! and its set in 1988 in a small town in America. 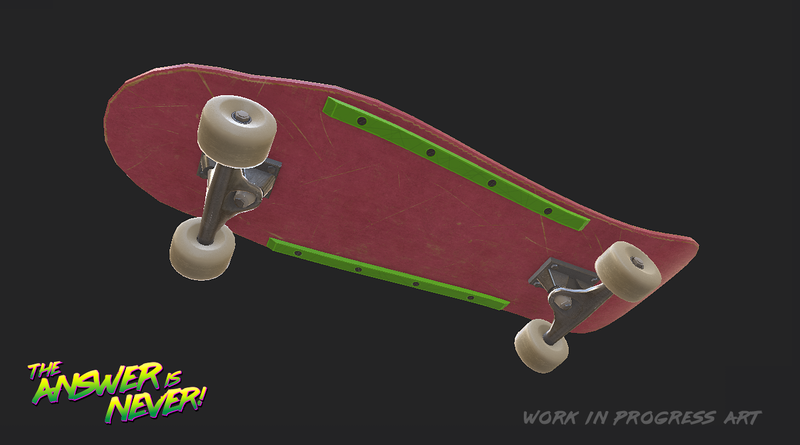 It's a story-based adventure game that uses skateboarding as the glue to tell the story. It will have free play options to practice tricks and explore and it will have a core story mode. Check out the development page and comment in the community with a post. I'm curious to hear thoughts or even ideas about what might be missing in a game like this. Check out some of the YouTube development vlogs to see what it currently looks like. I am using a few software tools for development. Mainly I am using Unity 5.65 as the core engine (in C#), Autodesk 3ds Max for model building, Substance Painter and Photoshop for texturing the models. I am using Audacity for audio editing, BMFont for working with UI text and OBS Studio for capturing development videos. Thank you for spending some time checking out my post. This game is currently under heavy development. This will be the storefont page and development blog headquarters for all updates as development progresses. I wanted to take a moment to say "Hello" to all of the new visitors who may happen on this page. The page itself is also a work-in-progress as I've done little to no art at all at this juncture. I've been writing code, using proxy shapes for testing. Check out the development blog to have a look at some of these systems working in the build.